Just out of curiosity, I looked to see if I could find anything similar in Indian Yoga mudra. Not exactly the same, because the left hand in facing outward, but the "Ganesh Mudra" seems rather similar. I have no idea if there is a relationship in origin. It may just be coincidence, because it seems a rather natural way to lock the hands. That's interesting. There are far too many of those mudras but can't say I've seen that one in use before. Thanks to all! I have reached out in PM to some with personal commentary. Does anyone know of a better way to be notified about posts I’m participating and such when mobile? For now I have just been going to the my profile section and clicking on the posts it says I’ve commented on. it is also a bit challenging to utilize and stay on top of this forum on my mobile devices, but they are so much a part of my life than 5ey should be, but still a reality. Yes you can. 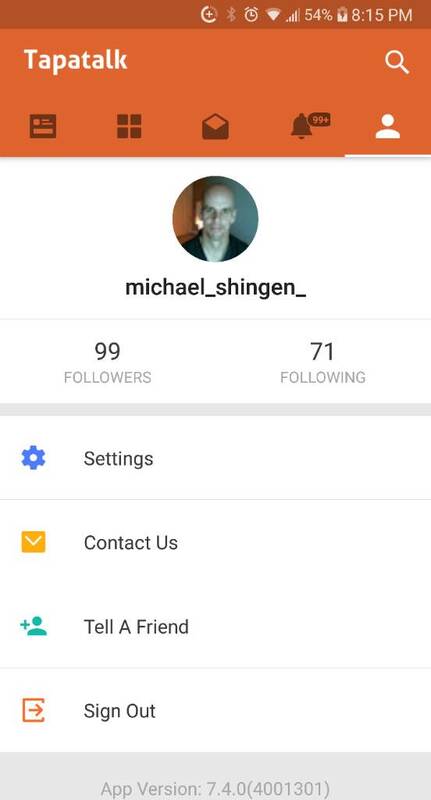 If you go into your profile on Tapatalk (see attached image), then goto "settings", then under your "push notifications" and "email notifications" yoi can set what you want to be notified about. Choosing to hold your hands behind your back to eschew tradition is the same as holding your hands in the mudra to embrace tradition. No matter which, a choice is being made, thought of, mulled over, decided, questioned, etc. Choosing to simply follow the rituals whether we know what the significance is yet or not removes the questioning from the action, which I feel is the point. Unless one is being asked to jump off a high cliff, sleep with the "teacher" or do some other really harmful action, or to become a spiritual Zombie, there is great beauty in this Practice of leaving your personal preferences, likes and dislikes, at the door and just throwing oneself into an activity. It is an important part of Zen, and most Eastern religious, Practices. Thanks, Jundo. I forgot to throw in that important bit! I am personally very minimal on ritual, but I only became that way after a few years of getting them in my muscle memory. The result of that is sometimes shashu while walking to the fridge, bowing to the toilet, and sometimes just sitting straight on the cushion for zazen and not bowing or doing any ritual until after the bell, or even at all. Sometimes I chant the Heart Sutra without thinking, and sometimes before or after sitting. I really just kind of go with how practice strikes me at each moment. I enjoy it all and have a great love of zen ritual as a practice, even the long form stuff. It merges with my more fluid daily life in a way that becomes natural with time. And I'm always ready for a formal zazenkai, robes and all. Both of your posts here really resonate. Beautiful words Geika, thank you. Many thanks for the cloud reference and seeing through them at some point in practice. I cannot say I see through them completely quite yet, but I do have an appreciation now as to the clouds and crystal clear blue luminescent sky co existing! It brings joy! I've been sitting regularly (missing a few days) for a month now, and I'm finding I still have a bit of trouble with breathing. I reviewed the Sit-a-Long about breath (here) to help me but I think I could use a tiny bit more advice. I keep catching myself taking such shallow breaths that I'm barely breathing at all. Ideally I should just let those breaths be short, but honestly it feels like I'd just stop breathing entirely. My body doesn't really appreciate that, so I start intentionally taking very deep breaths. Maybe it's the rush of oxygen, or endorphins or something, but it just feels so much better to breathe very deeply and slowly, but that unfortunately takes a bit of intention. Any specific advice here? The first thing that comes to mind is your posture ... are you keeping a natural straight spine? As far as I can tell, yes! I try to envision a rope pulling my head up directly above and the rest of my body following suit, then relaxing the rest of my body as if it were "hanging" off of my now-straightened spine. I of course also do the rocking back and forth to make sure that "up" is actually up. Once in awhile I notice I am slouching a little and correct it, but it never feels like a major adjustment. Even then, I could be doing something a little wrong, like leaning forward or back unintentionally or my spine not actually really being straight despite it feeling like it is. Hmmm. I would just say to be breathing from the diaphram all through Zazen. It is natural that, as one relaxes, the breaths become slower and lighter. Sometimes it seems that I might breathe less than twice a minutes. However, are you actually then gasping for breath, and feel like you are holding your breath in a pool? Or is it only that you suddenly focus on your breath and panic or become obsessed with it a bit? If the latter, it is just your mind. If the former, it is actually a physical breath issue. Just relax and breathe. Normal, natural breathing. You do it all day, sitting or standing, so what is different now? There should be nothing different about breathing in Zazen and just breathing while sitting, so I am not sure what could be causing this. It should be the same as breathing while on the sofa or breathing on the bus. Hmmm, hard to say then. It might be that, as if one sloaches it can interfer with the abdomen. Maybe try and experiment and keep an eye on your shoulders. Once you move from side to side to find your alignment, roll your shoulders back, dropping your shoulder blades. This can help straighten the spine, but also open the chest. Give it a try and see if it helps with the breathe. The sensation I get is that my body is becoming so calm and still that my lungs are unfortunately following suit and trying to be as still as possible. There's no gasping for breath, more of just a feeling of "hey, doofus, you stopped breathing, I need air". Perhaps I'm being too intentional in becoming calm so it's causing my body to act unnaturally, but at some kind of subconscious level, because I'm definitely not intentionally trying to take shallow breaths. I will try out your suggestions and report back after a few days. Thanks for the help! Yes, just sit like you are on the bus watching the scenery out the window. Nothing strange should happen to the breath. Kenny! Thanks for bringing this up! I often have the same experience when sitting. My respirations seem to become so calm I am almost startled and wondering if I'm getting enough oxygen. I work in healthcare and monitor things like this on a regular basis. I have not counted my own respirations while meditating as it is a very innacurate thing to do and would defeat the purpose of sitting. I have never heard of anyone becoming so slow in breathing during Shikantaza as to actually become oxygen deprived, let alone pass out or do some damage. There may be Indian and other forms of intense meditation where something like that could happen, but Shikantaza is so ordinary and gentle ... I can't imagine. The body would really let you know ... by gasping, by headache or light headedness, feeling like fainting ... if you truly were becoming oxygen deprived. You should just be breathing like you are sitting on the bus looking out the window at passing scenery, i.e., normally. It is sounding to me most likely that you guys are just latching on to this and maybe talking yourself into it. However, if there really are some physical symptoms of oxygen deprivation, that is a different story. In the case of anything like that, talk to your doctor! However, Shikantaza is very far from any kind of intense meditation like that. Last edited by Jundo; 05-31-2018 at 04:58 PM. I'm gonna stay with the agreement that maybe I am latching onto this more than I should. Maybe I should just enjoy the calmness I'm not so used to experiencing more and sit with that. Yes, in Shikantaza we are not searching for something or chasing a curtain state or mind or being. Shingen: I sat a few times now, and I am definitely seeing benefits from lowering the shoulders and pushing them back slightly, and even more if I intentionally stick out my chest a little bit. I still take very shallow breaths when I'm not paying attention, but I never get the sensation that I'm running out of air. Thanks for the tip! It is sounding to me most likely that you guys are just latching on to this and maybe talking yourself into it. That actually sounds pretty sensible to me, so I'm wondering why it's the case! I am still a bit perplexed by the shallow breaths, so I guess I'm relaxing just a bit too much? I can try focusing on my breath a bit more, or "everything and nothing in particular" / "the clear blue sky", which might bring me just enough "presence" to keep my breath a bit more natural and not so shallow. I'll sit on that a bit longer, it could be that I'm just overthinking the shallow breathing and it's not actually getting in the way of anything. I have severe Cerebral Palsy. My. body moves almost constantly. However, when I focus on my breath my body becomes still without me trying. If I try to be still, my body starts to move. If I move while doing zazen in my wheelchair I just notice it and gently return my focus to the breath. Hello Rising Crow, it is good to see you. Then, you do what works for you. Okay all, I haven't posted a lot in tree leaf lately because I have truly been focusing on the hinderances and my other studies and practices. I have now reached the fourth week of my hinderance practice where I am to focus at least one meditation for the next 7 days on: restlessness, anxiety and worry. The opposite being focus and stillness. I am reviewing beginner's teaching #11 about the breath and not focusing on it during meditation to sit Zazen. I feel I am now open to getting a little deeper with Shikantaza Zazen now, but still find difficulty in the "just sit" aspect. I am familiar with the Samatha and vipassana meditations and less with appasati and even less with Zazen (other than what I'm learning in here). Can any of you share your journey about transitioning into Shikantaza Zazen as described in number 11 and the like? In most forms of Zazen or meditation, there is good and bad, successful and not successful sitting. In Shikantaza, it is impossible by definition to have any bad or unsuccessful sitting. Simply sitting is, ipso facto, success. Good or bad, successful or unsuccessful judgments are washed away in automatic "Good Sitting which is Successful Just By Sitting" (one possible way to translate the meaning of the word "Shikantaza" right there). Unlike most forms of meditation, that means that even those sometime days of angry, confused, cloudy, wallowing in emotions sitting is "good, successful sitting." However (now the wondrous twist, the tricky catch! ), when one truly lets each and every sitting be itself, good and successful just by being itself, there is thus something transcendent of anger, confusion, cloudiness and wallowing simply by letting "anger, confusion, clouds and wallowing" (and all conditions of life) just be "anger, confusion, clouds and wallowing" (and all conditions of life as they are). As strange as it sounds, one is thus "free" of anger, confusion, clouds and wallowing even in the continued presence of anger, confusion, clouds and wallowing, as much as in their absence too. The "anger, confusion, cloudiness and wallowing" is completely transformed in Wisdom and Clarity by our non-resistance and equanimity about even our passing feelings of resistance and lack of equanimity. So long as one is sitting, with the act of sitting as all that is demanded of the act of sitting, this is the universe in fruition. We are always trying to "fix" life. The cause of the "restlessness, anxiety and worry" is precisely our dissatisfaction with the state of things, need to fix or resistance to how things are. I am not proposing to wallow in "restlessness, anxiety and worry." Rather, the radical dropping of need to fix ... including to fix anything including some passing "restlessness, anxiety and worry" ... is precisely the contentment that is the cure for "restlessness, anxiety and worry". Rather counter-intuitive, but it works. I am not sure what a "hindrance practice" is. Shikantaza is our "no hindrances even in a world of hindrances" practice. Last edited by Jundo; 06-13-2018 at 03:30 AM. I know that you sometimes feel like a broken record, Jundo, but sometimes rereading the "Jundo Classics" will cause something to click in a way it never has before, despite having read it the same way for years. Thanks for your persistence, and patience. I seem to be having some troubles with using ‘Hangouts’. I’m not sure this is the correct thread to be posting this question in, but here goes. I’ve been a member for a little while now, and manage to attend Zazenkai with my regular sangha often, but in the times in which I cannot attend, or make the drive to temple, I sit by the altar in our home. I wish to sit with this community when doing so, but have troubles with hangouts. I have noticed that there seems to be two sitting schedules on the site, one says Mon-Sunday sittings, and the other is a list that says “Zazen” with... and whoever the respective person is, I’m assuming leading the zazenkai. That being said, I’ve tried sittings from either list, and cannot see, nor hear if I’m in the right place, no bells, and either a blank screen or just myself on screen. I’ve checked the settings of the app on my phone, and it should be working properly, but this still keeps happening. Perhaps someone could help me determine what I’m doing wrong? Thank you so much. I had the same problem with my phone for the weekly Zazenkai. My solution was to use Google Chrome on my computer instead. My phone seems to work for the daily sits though. Don’t know why but that is how I got it to work. I have tried sitting with groups from that link as well as the other one that has a green heading, but each to no avail. I’ll try again today at four, and if that doesn’t work I’ll let you know. Yeah, I’ve been trying to sit with any group sitting really for some time, but neither my phone nor computer are working. I don’t think I’ve tried using Chrome on my computer, but I’ll give that a shot first today, and see what happens. DB may need to be added to the Google Circle if he is not already. I remember I could not see your links until I was part of the circle. My name is Dale, and here’s the link. Also, did yah get a chance to sit today online and what was the outcome? Are you getting into a room and it is just that no one is there? Unfortunately I was called in a bit early to work that time. I am absolutely going to keep making attempts until it works out. I thought that too, but I ended up sitting for about an hour with no bells. Jundo, have you considered creating some playlists on YouTube? Would make going from talk to talk a whole lot easer. Other than that nitpicking, this has been fantastic, thank you so much! Last edited by Vanayr; 01-02-2019 at 11:00 PM. Still having a heck of a time navigating this forum- still, like a blind squirrel, I am occasionally finding the nut! Please forgive me if I post in the wrong place until I get this figured out. I am up to video 6 of the Intro series. Must stop to comment! These are truly wonderful lessons!!!!! Uniquely so for me. I was one of Fr. Pat Hawk's students in the Zen Desert Sangha in AZ for several years before he passed. I entered that relationship and training on an inner calling but no experience with zen at all. And Roshi's style was indescribably hands-off and yet laser clear in dokusan as I discovered the challenges of zazen. I read many many books, but it was two years in, when in utter frustration, I brought them all in a paper sack to the zendo and donated them. He said, "Good! Now we can begin." Not because I had read enough, but because I saw the futility of intellectualizing and was ready to experience. All that frustration, and giving up on habitual intellectualizing were for me, a necessary part of the learning how to just sit. Obviously not for everyone, but yes, for me. Your clear and generously well prepared videos complete the picture and clarify the soto tradition more fully. I believe the Diamond Sangha lineage in which I began is somewhat different, though not greatly. I believe I have stepped in to a manageable new kind of practice here- doing this online. I have not been able to find a "compatible" zen master. I was trained out of all the ideological stuff, the guided meditations, the concepts, the dogmas, and I never found another teacher who could teach with so few words as my skillful first zen master. Perhaps many of us have a hard time finding another teacher if we lose our first one. I am old enough now that travels and retreat/sesshins are difficult. So I thank you for these wonderful lessons, in which I have learned much already in just 6 video lessons, even after several years of active practice. Once I figure out to navigate this complex forum and website, I'll be up and running and trying to find out how to do a live sit. Now I will proceed with the beginners lessons. And beginning my daily sits at home. My goodness, I have lived long enough to be able to do this! Imagine that. You are in JUST the right place. Always so. FEELING LOST AROUND THE COMMUNITY? Contact our "SANGHA BUDDHIES"
I found this thread this morning after yoga class. There has been difficulties with my practice in zazen. I am attending a kundalini yoga class that's run by my friend Jitendradas. The aim is to help me not master yoga, but to help me be determined to wake up in the morning and exercise. I am hoping I will learn in Shikantaza what do do about falling asleep all the time this year. two faces of the same die. a thousand mistakes, ten thousand mistakes.